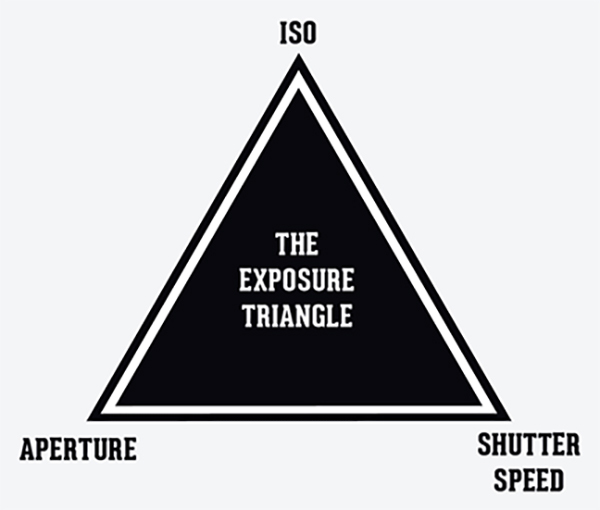 What is the exposure triangle? How do the "sides" affect my photographs? Each factor is interchangeable in terms of exposure, so that a decrease or increase in one factor must be met by the same amount of change in another. (More on this below!) And each has intrinsic secondary effects on your composition — longer and shorter shutter speeds freeze or blur motion, smaller apertures give more depth of focus, and generally higher ISO causes more noise as one attempts to get more signal out of less light. The problem with the phrase "exposure triangle" is that the relationship between these three factors does not actually share any of the properties of a triangle other than "threeness". That makes it a bad analogy, which can introduce more confusion than necessary, as new photographers attempt to reason from the information they've learned. Let's say we have a triangle where the sides (or corners — it doesn't matter) represent a shutter speed of ¹/₆₀th, aperture of f/11, and ISO 100. 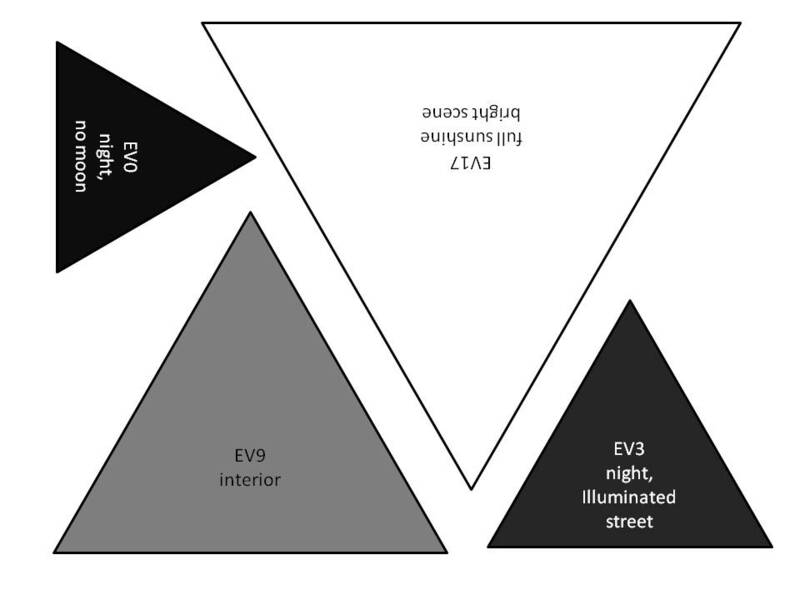 We draw a triangle, and we label that "Properly Exposed for EV 13". (See the Wikipedia article on EV for where the value "13" comes from). So far, so good — we've got our triangle. 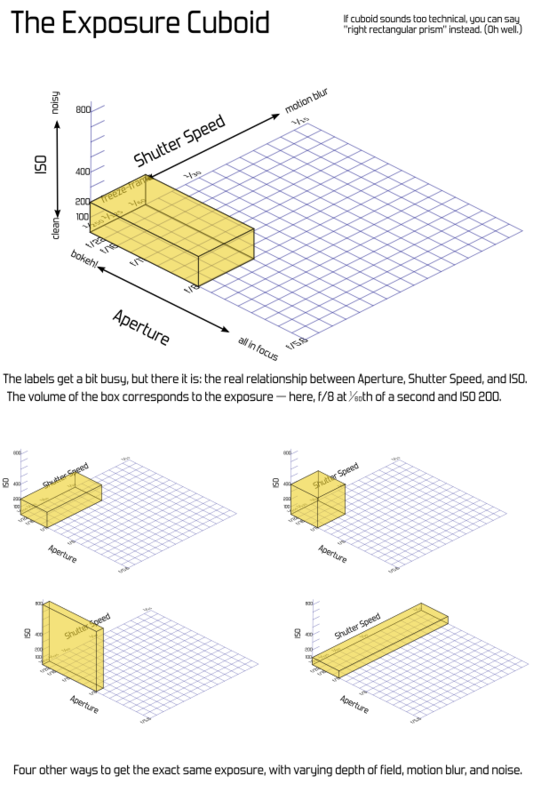 Now, what if we want to change the shutter speed to ¹⁄₃₀th, and the aperture to f/16? That should give the same exposure. But what happens to our triangle? Do we double the size of one line, and halve the other? Or is there some other relationship that's meaningful? It doesn't take much mucking about with a pencil and paper to determine that, no, this just breaks down. If you attach any actual meaning to the dimensions of the sides or the angles of the corners, not only is there no relationship to the area or size of the triangle, many settings yield impossible triangles even though they're perfectly valid exposure settings. Basically, it'd be just as useful to say The Exposure Clover, or The Exposure Tricycle, or the The Exposure Set of Juggling Balls. Or the Exposure Branches of the U.S. Government, although that may be harder to draw in an intro-to-photography book. I humbly submit the following illustration for anyone's use; I'll leave the other suggestions as an exercise. I'm joking, but I'm also serious: there's nothing particularly useful about the triangle for explaining these factors, and in fact it might be detrimental. So, we might as well use something funny, if the only point is to be memorable and associated with the number three. There are three exposure factors you can change on your camera, assuming fixed lighting in the scene. If you want to keep the exposure the same but change a factor, you can change either of the other two factors in the opposite direction. So, for the example of ISO 400, f/8, ¹⁄₁₂₀th, if you wanted to freeze motion better with a shutter of ¹⁄₂₄₀th, you could keep the exposure the same by changing either ISO to 800 or aperture to f/5.6. Or, (if you are interested in thinking of this geometrically) we can use a better representation: The Exposure Cuboid — a rectangular box. That sounds nerdier and not nearly as catchy, but it has the advantage of actually being useful. Each dimension — width, length, height — corresponds to one of the exposure factors, and the volume of the box corresponds to the the exposure. This works out exactly right. Each of the three settings can be adjusted independently, and a doubling of any of them doubles the overall exposure — or cutting one in half cuts the overall exposure by half. This is just the same way that changing the length of one of the sides of a box changes its volume. So, we get both a visual analogy and an accurate mathematical representation. And it's nice from a simplicity point of view, because we can start by leaving off one of the dimensions. 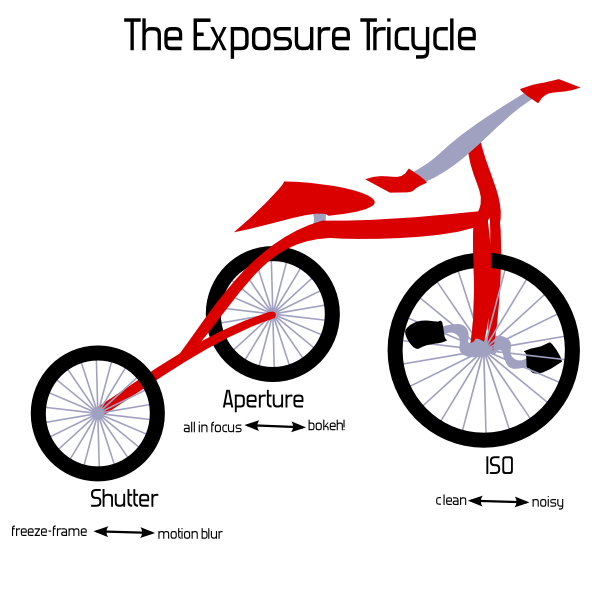 If one were using this as a tool to actually explain exposure, we'd start with shutter speed and aperture alone — that's a (plain old regular two-dimensional) rectangle. The Exposure Rectangle still isn't quite as catchy as triangle, but at least everyone knows what a rectangle is, too. Along the other axis, we'll mark apertures. Start at the first mark with something small, like f/22. Then, follow the standard sequence of aperture values from there, again making sure to double for each rather than just marking each square — so, f/16 at the second mark, f/11 at the fourth, f/8 at the eighth, f/5.6 at the sixteenth, and so on. Now, you can directly visualize the effect of increasing or decreasing one of the factors. The exposure of the scene is the area. Any combination of aperture and shutter speed which gives a rectangle of the same area will give the same exposure. Doubling the shutter speed actually doubles the exposure, just as one would expect. If you draw a rectangle with one corner at the origin and going out to ¹/₆₀th and f/11, with the labels as above, you get a 4×4 rectangle — area 16. (Here, the actual number 16 is just an artifact of how we decided to start our labeling and the size of the squares — the actual number is meaningless.) Change to ¹⁄₃₀th and f/16, and it's 8×2, or ¹⁄₁₂₅th and f/8 for 2×8 — either way, still the same area. And adding in the third factor, ISO, is simply extending this to the third dimension. This is harder to draw on paper or put in a book, but once you have the idea of the rectangle down, it's not a far leap conceptually. Imagine an ISO axis extending upward out from your page, labeled similarly to the others. The exposure value becomes the volume of the cuboid, and pretty much everything works the same way. Another convenience is that shutter-priority or aperture-priority modes can be visualized as flat rectangles within the 3D box. Turn it so whatever two values are adjustable are conveniently aligned. But a problem with this is that the paper — or cuboid — gets big pretty quickly. And those big areas get cumbersome to work with. That's where the concept of "stops" comes in. Rather than working with linear labels and area, we can work in a logarithmic space based on powers of two. That might sound intimidating, but it simply means that we count the number of doublings, rather than using the direct numbers. Again, sounds like I'm using too many big words, but the great thing is that counting is easy. In fact, you don't even have to count — every modern camera has a meter which "weighs" these things automatically and tells you how many stops you are off. Just like a balance scale. That loses out on the concept of "threeness" entirely, and it feels a bit unnatural to add things to darken exposure. Someone spending a lot of time thinking about which direction is up isn't really learning the important part. It also doesn't cover flash duration properly. And I sure did end up putting way too much explanatory text there. That's problematic for an introductory diagram (although I'm sure with some work it could be cleaner). Anyway, the point is: it's catchy to say "triangle", and since there's three factors, it seems obviously true, garnering automatic nods from people who are familiar with the concepts already. And for many people it's pretty harmless. However, there's a more useful geometric explanation which can actually be used to show how the factors really relate. The cuboid may feel like jumping in the deep end, but the rectangle shouldn't be too intimidating, and going on to the third dimension is a natural progression in the lesson. If that seems too complicated, why bother with a geometric analogy at all? I know that in the last few years it's become a common idea and Peterson's books are very popular. I know many people even find it helpful. I'm not really on a Quixotic crusade to make sure every use of "the exposure triangle" is actively stomped out — but I do recommend against introducing it to new users. Putting the three factors in a bullet-point list works just fine, and doesn't add any inadvertent confusion. Or you can stick with the tricycle. The source files for the latest version of this article, including SVG source versions of the images, are available on my web site. Digital Photography School has an excellent write up about this, but I will summarize as best as I can. As the name suggests, each element effects image exposure, or how bright/dark the image is. Pick a side of the triangle, increase its value (aperture is special--a larger aperture corresponds to a smaller F-number), while holding the other sides constant, and the image will get lighter. So for example you have an ISO of 100, Shutter Speed of 1/250s, and Aperture of F2.8, simply increasing the ISO to 200 will double the amount of light in the image. Likewise increasing the shutter speed to 1/125s, while holding other values constant, will again double the amount of available light in the image. Now while, each of these three settings give you an independent control (the sides are not explicitly linked) of how much light goes into your image, each has a secondary use, often used for the artistic purpose of the photo. ISO controls how sensitive the sensor/film is, which in turn effects how much noise/grain is in the image. For films, you could control the amount of grain in the image, usually for artistic effect. In modern digital camera's, ISO controls the amount of sensor noise comes from the camera sensor. While film grain was desirable in some situations, sensor noise is almost never desirable. So often photographers will pick the absolute lowest ISO setting they can get away with maintaining enough light to effectively shoot their images. The lower the ISO value, the less sensitive the sensore is, the more light required, and the less noise that is expected. Aperture controls how large the lens opening is, allowing more or less light to come in, while also controlling the depth of field. The depth of field refers to the distance behind and in front of the focal point that is in focus. A shallow depth of field will "blur" out the background. This effect is often used for portraits to put more emphasis on the subject. 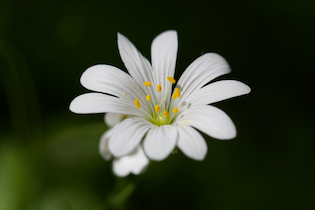 The larger the aperture, the more light gets used, the shallower the depth of field. Shutter speed controls how long the camera's shutters are open, again allow more or less light to come in, while controlling motion. A fast shutter speed effectively stops motion. This is useful for action shots, like sports. A slow shutter speed lets motion blur, many times used for artistic effect, such as blurring flowing water. Now imagine you measured the light of the scene and you found e.g. sunshine with EV15. 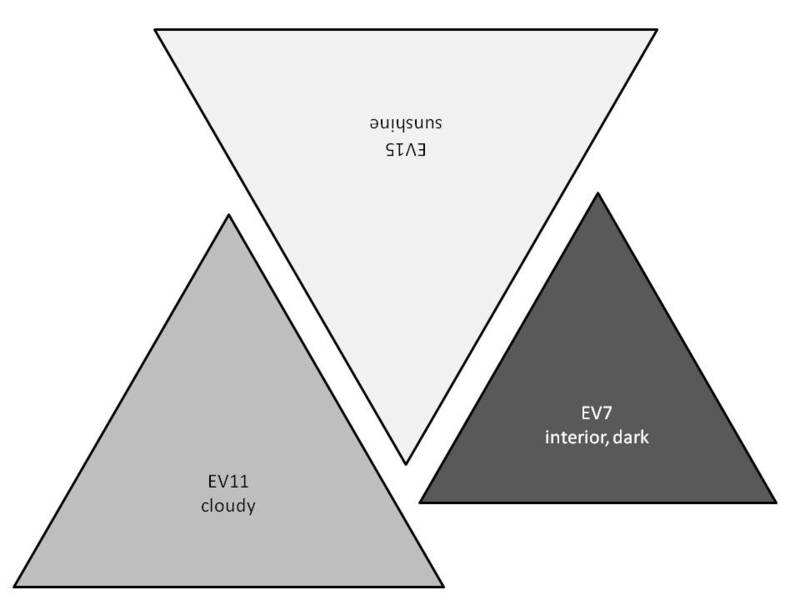 Place the transparent EV15 triangle on the cardboard diagram and align it with the edges for ISO, shutter speed and aperture. Wherever you place it (as long as camera and lens allow such settings) you will get the same exposure. So this is actually a quantitative exposure triangle, that can tell you the exact relation between the 3 (or 4) parameters of exposure. But with the little colored triangles it also shows the qualitative differences in noise, motion blur and defocus blur/diffraction, just like all the other exposure triangles do. What do you think? Can this be helpful? And please excuse my english, I'm not used to writing in english about photography in a forum. Should I replace the wording anywhere? 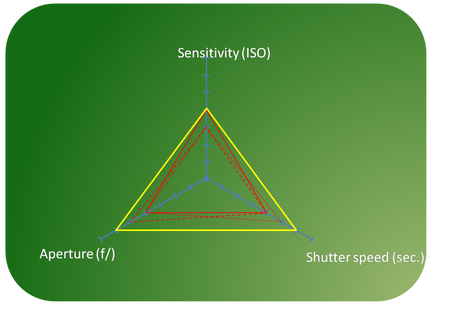 While the other answers explain the concept of exposure triangle quite well, exposure triangle has the downside that it gives impression you only have three variables to control exposure - shutter speed, aperture and ISO sensitivity. Actually there is fourth variable that works similarly in the system - illumination of the scene. By doubling illumination, any of the other three variables can be reduced by one stop; and by halving illumination, any of the other variables needs to be raised one stop. It also works in opposite direction - e.g. increasing ISO by one stop allows halving illumination. flash with shutter slower than sync speed will illuminate just as much as with shutter on sync speed. Some light sources are not under photographer's control, but their behavior can be somewhat anticipated (such as sunlight or streetlights). Photography means "writing with light". Exposure triangle gives the false impression that you may not bring your own pen. If you pull one of the angles of the triangle further from the center (thus increasing its value) then it will automatically, in turn pull one or both of the other angles (thus decreasing its/their value). While the exact math is not necessarily respected, the conceptual visualization is there. 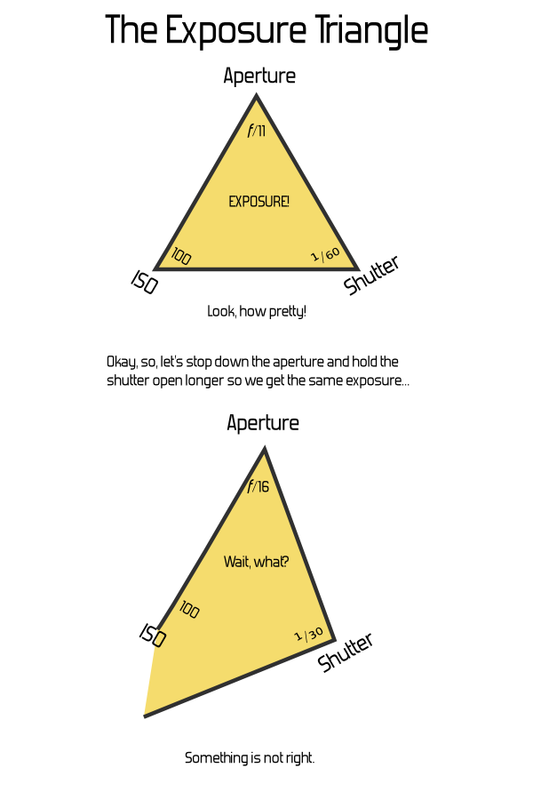 Although there are already a couple of great answers here, let me provide my own take at the exposure triangle. This one is intended to be both genuinely triangular (meaning that it is triangular in a deeper sense than just having some “threeness”) and mathematically accurate as a representation of the exposure equation. 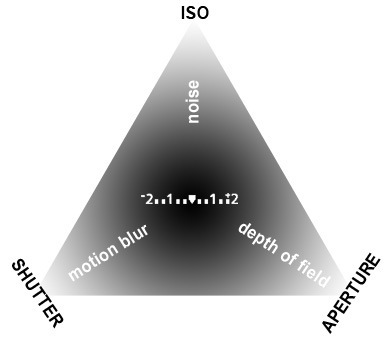 Here is how it works: each point inside the triangle represents a combination of aperture, ISO and shutter speed. The specific combination can be read by following the colored lines and reaching the scales with the matching colors. For example, the yellow dot is (1/30 s, f/2.8, ISO 1600). All the points inside the triangle provide the same exposure. This diagram is intended to illustrate the trade-offs one makes when choosing exposure parameters, brought by the fact that changing one parameter at constant exposure implies a needed change in at least a second parameter. or move obliquely, both down and left, along the green line of constant shutter speed; then we would be opening the aperture to f/2. Obviously we could also take any path in between, and end with an unlabeled combination such as (1/20 s, f/2.5). There is just one weakness in this representation: the fact that the orientation of the axes is not obvious at first sight. For example, the f-number increases faster when going straight up, whereas the aperture scale is drawn, for convenience, along the tilted left edge of the triangle. The implication is that, while it should be clear that the label “all in focus!” belongs to the top corner, it may be less obvious that the label “bokeh!” belongs to the whole bottom edge (along the red line for f/1.4), not just the bottom-left corner. Most cameras have a built-in meter, negating the need of any extra tool for actually computing the exposure. Those cameras lacking a meter are all analog cameras, used mostly at a fixed ISO. For them, the triangle could be redrawn for a fixed ISO, with a light level scale replacing the ISO scale, thus making a workable computing aid. I prefer exposure slide rules for this task though. 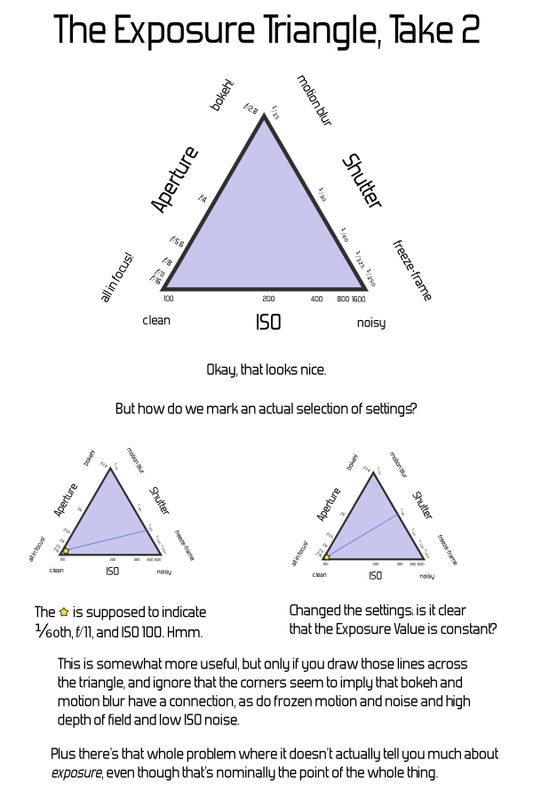 Although the whole idea of this diagram came to me by looking at ternary plots, I also drew some inspiration from previous answers. The labels on my plot are shamelessly borrowed from mattdm’s “The Exposure Triangle, Take 2” (awesome answer, but he got the aperture scale backwards). Actually, my triangle is intended to fit as “The Exposure Triangle, Take 3” in mattdm’s logic progression. And then I borrowed the colored grid from Matthias’ answer. pulling the corners of that gray triangle together until they meet at a single point, while at the same time pulling the grid lines. take a cross-section along an equal-exposure plane. I wonder if I am the first person to come up with this. It would be weird, as it seems so obvious in retrospect. 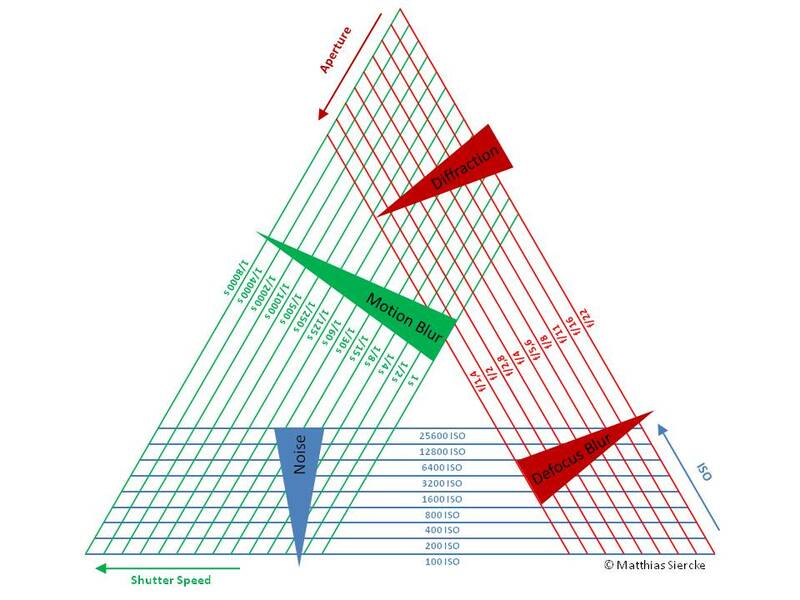 I did an image search for “exposure triangle”: there are tons of them but, with the sole exception of Matthias’ diagram, none of those I found is quantitatively meaningful, although quite a few are almost there, only lacking the grid. I may then claim myself the inventor of this triangle. Please, tell me if you have seen it before, so that I do not embarrass myself for too long with such a claim. Given all the excellent answers so far, I'd just add that whoever came out with this metaphor, probably had a bad (but catchy) selection of words, and what he meant to say is "the exposure tripod" - i.e., "the three legs of exposure". He did not intend to imply a relationship (dependency) between the 3 variables, but merely to name the parameters affecting the exposure. While Aram has a great technical answer, I'm not a math major (I'm a programmer) and like to keep it simple. In my experience most people grasp it a lot quicker using the picture underneath. Many people make use of this little reference guide and I even got it on a lens cloth. Basically, every setting has a certain effect and a compromise. Higher F values give more depth of field, but let in less light. Higher shutter values reduce blur, but let in less light. Higher ISO values give more light, but will start creating a lot of noise at certain levels. And because of all those compromises I will not suggest what to do with your settings in certain situations because your desired goal can be achieved in multiple ways with different effects on your photo. 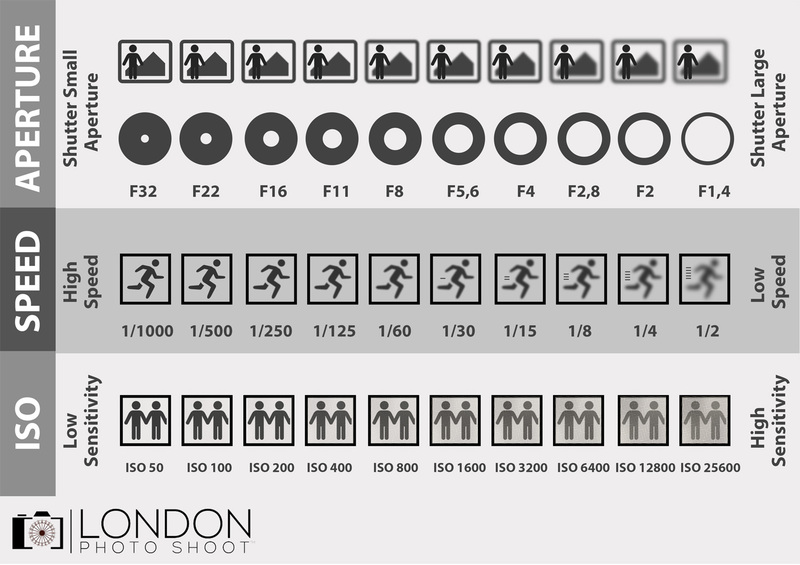 where Δt is the shutter speed, f is the aperture (not focal length), and ISO is the camera/film sensitivity. 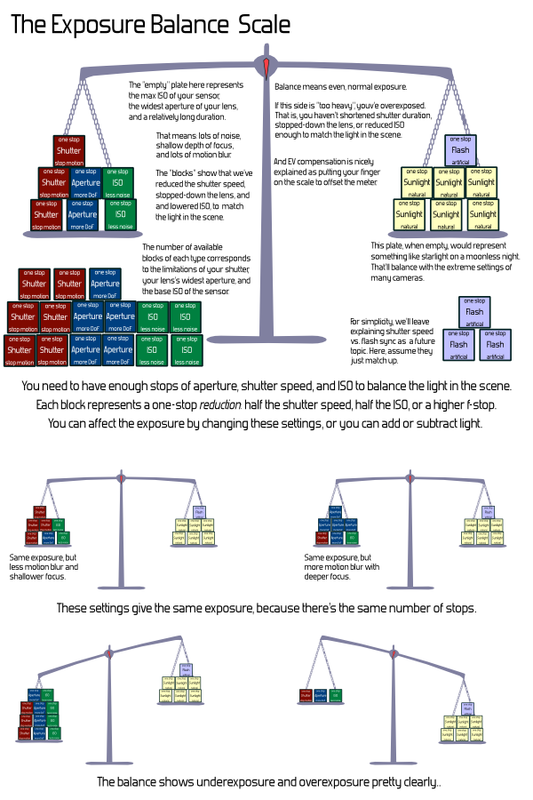 So if we used, say, f/2.8 initially, if we double the exposure time (increase it by a stop) and we want the same exposure we need to use f/4 (move up a stop on the aperture scale). This is called the exposure triangle. It's much easier to work with the exposure in logarithmic form, and think in terms of stops. Where log2 is the base 2 logarithm. Note the minus sign there. Now it's obvious that if we decrease exposure time by, say, 3 stops, we need to either decrease aperture (open up the lens) by three stops (e.g. by going from f/5.6 to f/2), or increase the ISO by three stops (e.g. from going from ISO 100 to ISO 800), or by some combination of the two (e.g. ISO 200 and f/2.8). Now in general total image noise is sort of inverse proportional to the total exposure (not precisely true, but good enough), and pixel noise (i.e. noise at a single pixel) is proportional with the ISO. Also, baring lens limitations and focus accuracy, the most common cause for blurry pictures is too slow of a shutter speed. With this knowledge you should be able to decide what's the best way to shoot photographs in every scenarios, prioritizing what's most important to you (sharpness, noise, etc). Exposure triangle is a way to easy remember characteristics affects the brightness of a picture. Not the answer you're looking for? Browse other questions tagged exposure terminology or ask your own question. How does aperture affect exposure? Is there a formula to calculate ISO according to Shutter speed? What should I set my aperture to when there's a lot of light outside? What can I do to improve exposure on my Canon 30D? Does a high aperture impact exposure differently than a high shutter-speed? How do I use spot metering? Can a smaller sensor's “crop factor” be used to calculate the exact increase in depth of field? How can I make a very sharp photograph with a point & shoot camera? What is “exposure safety shift”? How did people calculate exposure in the pre-light meter era? 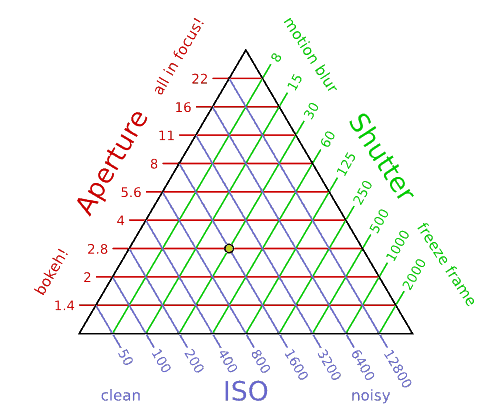 Why is ISO counted as part of the exposure triangle? How did photographers get the exposure right back in the day with only full-stop increments? 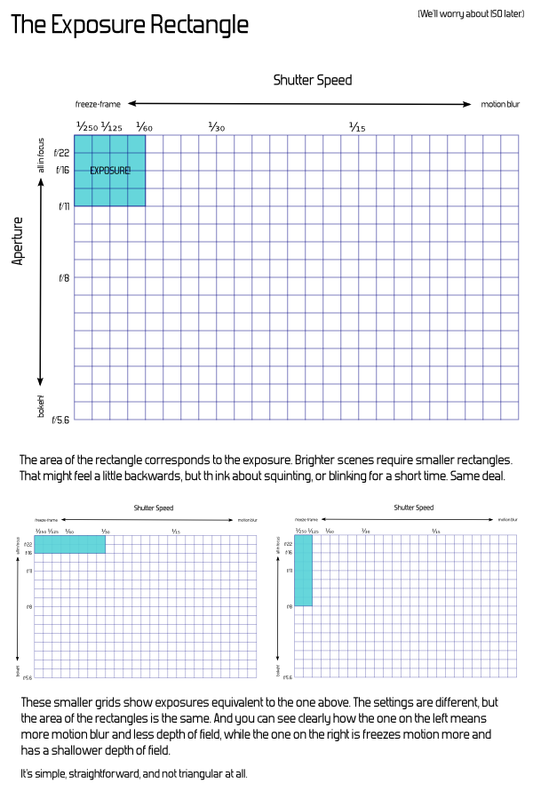 Why is distance absent from the exposure triangle?